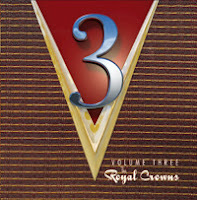 Snob's Music: The Royal Crowns get ready to unleash "Volume 3"
The Royal Crowns get ready to unleash "Volume 3"
Toronto rockabilly act The Royal Crowns aren't known for working fast. The fan favorites celebrate their 20th anniversary this year by releasing their third full length. The 15-track album, Volume 3, comes out on May 22nd. The Royal Crowns play a pair of CD release shows May 25th & 26th at The Dakota Tavern.